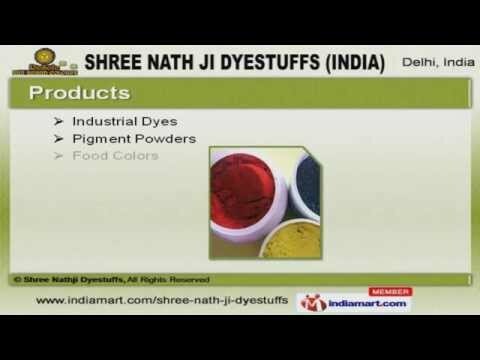 Welcome to Shree Nathji Dyestuffs. Manufacturer & Exporter of Industrial Dyestuffs & Food Colors. The company was established in the year 1991. We have spread our wings to Turkey, Italy & USA & cater to industries like Textile, Leather & Cosmetics sectors. Customized solutions & timely delivery schedules help us to achieve an unrivalled position in the industry. We offer a wide assortment of Industrial Dyes, Pigment Powders & Food Colors. Basic, Solvent & Acid Dyes offered by us are widely acclaimed in the market. We also provide Solvent, Acetate & Petroleum Dyes that are available at affordable prices. Along with that we offer Organic & Inorganic Pigment Powders that are extremely reliable. Synthetic Food & Lake Colors offered by us that are nothing but the best solution for all your needs. We offer Pigment Pastes that are available at industry leading prices.